Core Audio Technology has announced all-new system concept, which they refer to as being: The Fully Digital Home Theater. This system incorporates Core Audio Technology’s Datasat RS20i paired with their fully digital amplification technology, creating a true, fully-digital multichannel system that goes to analog only when the signal hits the speaker cables. The full signal path is digital and all processing is handled in the digital domain without any conversion, upsampling or oversampling. 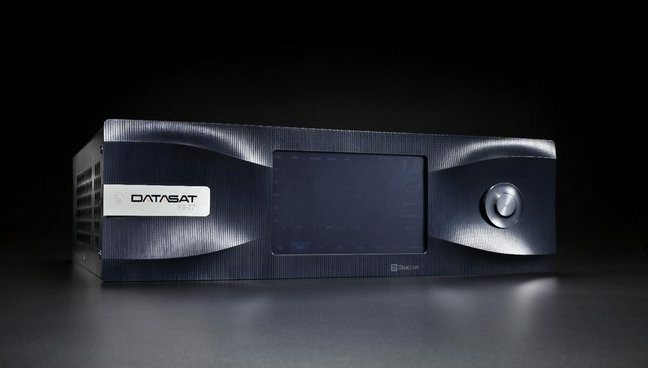 The Datasat RS20i multichannel processor is capable of 16-channel plus surround sound and has 86 inputs, 34 analog and digital outputs. It also provides an active crossover, parametric and graphic EQs, and the multi-phase multi-mic impulse correction of Dirac Live. The D/A converters in the RS20i are state of the art and Core Audio Technology’s Kratos Fully Digital Amplifiers are utilized via the digital outputs to bypass the conversion and preamp stages of the processor for the ultimate low-noise, low distortion sound. The Kratos utilizes an ultra low noise linear power supply based on our Kora and Kalos designs, with separate regulated rails for reclocking, the pwm controller, and output stage. The Kratos Digital amplifier takes a digital input, reclocks it, amplifies it in the digital domain, and then the signal is demodulated to drive your speaker directly. This means there is no D/A conversion, no analog cables, and no separate preamp or amplifier. The Fully Digital Home Theatre systems start at $25,000 U.S. Look for more details to become available at: www.coreaudiotechnology.com.